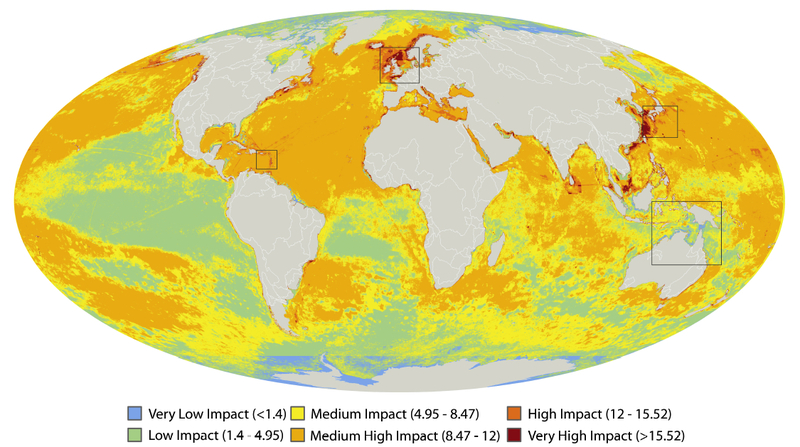 A new study in Science reports more than 40% of the world ocean is heavily impacted by human activities. Scientists from UCSB and NOAA combined 17 data sets of different human activities, examining overfishing, fertilizer run-off, commercial shipping, and pollution, and analyzed the effects on marine ecosystems, including coral reefs, seagrass beds, continental shelves, and the deep ocean. The team also examined climate change by three measures: sea surface temperatures, UV radiation, and ocean acidification. These were found to be among the most important factors in global impact. “This project allows us to finally start to see the big picture of how humans are affecting the oceans,” said lead author Ben Halpern, at the National Center for Ecological Analysis and Synthesis (NCEAS) at UCSB. “Our results show that… the big picture looks much worse than I imagine most people expected. It was certainly a surprise to me.” The most heavily affected waters include large areas of the North Sea, the South and East China Seas, the Caribbean Sea, the east coast of North America, the Mediterranean Sea, the Red Sea, the Persian Gulf, the Bering Sea, and several regions in the western Pacific. The least affected areas are largely near the poles. “Unfortunately, as polar ice sheets disappear with warming global climate and human activities spread into these areas, there is a great risk of rapid degradation of these relatively pristine ecosystems,” said Carrie Kappel, a principal investigator on the project at NCEAS. The researchers note there’s still time to preserve the more pristine areas. And we can all do our part. Know what you eat. Know what you buy. Buy less. Eat less.